Saarinen House has been hailed as one of the most significant residential projects in America—a Gesamtkunstwerk, or total work of art. Both an architect and a painter, Eliel Saarinen planned each detail of his personal environment from the design of the house and gardens to the interior furnishings. The dining room at Saarinen House represents his masterful use of geometry and color. 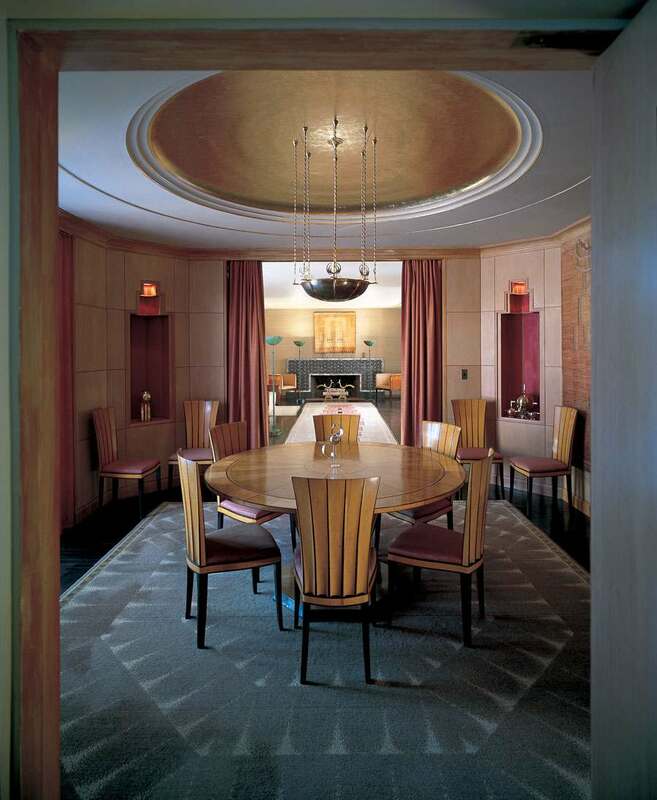 The square rug, with its octagonal pattern, establishes the geometry of the space and allows for a subtle transformation of shapes throughout the room, terminating in the concentric circles of the gilded domed ceiling. This rug and the Pewabic tiled fireplace mantel in the adjacent living room were both originally designed by Saarinen for another dining room which appeared in “The Architect and the Industrial Arts: An Exhibition of Contemporary American Design” at The Metropolitan Museum of Art in 1929. Chinese red corner niches and dramatic orange and gold textiles provide vivid bursts of color, offsetting the warm golden hues of the paneled walls, veneered dining table with side chairs, and the brass chandelier and serving pieces favored by Saarinen.